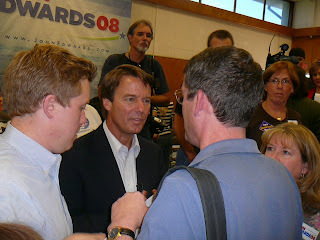 John Edwards addressed the Democratic National Committee this morning. Here's the Webcast from the DNC Website. 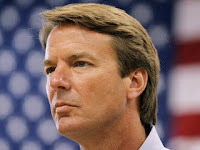 CARRBORO, N.C. (Associated Press) — Democratic presidential candidate John Edwards, in his fight against domestic hunger, called on Congress Wednesday to take immediate action to fund programs that provide food services for millions. "This is an issue that we can actually do something about," Edwards said, calling on Americans to do their part at an individual level. "I think we have a moral responsibility as a country to stand up and take action to where no man, woman or child in this country should feel hungry." Edwards' proposal urges Congress to pass a farm bill that would provide food stamps and support food banks. It asks lawmakers to reform the food stamps program to help more families get more assistance. The plan also urges Congress to quickly provide $5.1 billion to help low income families pay their winter heating bills to free up extra money for food. The former North Carolina senator said that he would help low-income children get more access to healthy meals, support programs that provide meals for the elderly, and develop a new program that would identify and provide for neighborhoods that don't have full-service supermarkets. 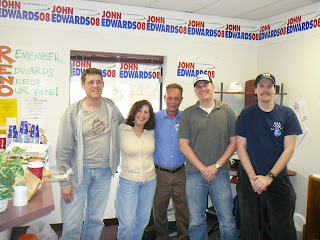 Edwards announced the plan shortly before a scheduled appearance at a food bank in Carrboro. More than 35.5 million people in the United States went hungry in 2006, according to a Department of Agriculture study. Of those, about one-third reported they had "very low food security," meaning they had a substantial disruption in the amount of food they typically eat. Our carpool left Sacramento for Reno a little before 8 am on Saturday morning. We returned last night, almost exactly 36 hours later, with new friends and great memories that will last a lifetime. Upon arrival at the Reno headquarters slightly after 10 am, we received a very warm reception by Reno staff and volunteers who thanked us countless times before turning us loose on the phones. After what seemed like a split second, our group had made over 1,500 calls to Reno area residents, encouraging their attendance at a town hall the following day. The campaign supplied a pot luck dinner and everyone enjoyed the family atmosphere as we talked of the campaign, politics, and life in general. As dinner wrapped up, Oliver Gottfried, the Nevada State Director, huddled up the crowd and spoke of the campaign's strategy and answered questions. Carter, another campaign staffer, then addressed the group about the following day's activities. We arrived at Proctor Hug High School yesterday morning at 9:30 to help with set up. 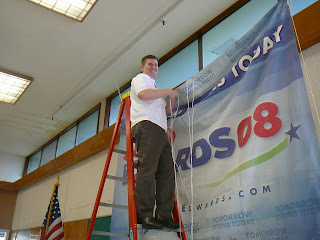 Matt (a carpool participant) and I addressed hanging the backdrop and signage as others helped with setting up chairs, laying out literature, visibility, and a variety of other tasks. Before long, tasks shifted to signing people in, directing parking, and generally welcoming attendees. 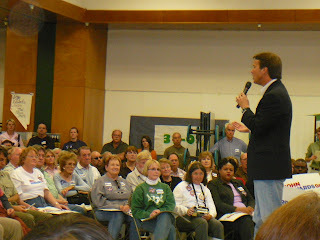 Nevada assembly members Debbie Smith and David Bobzien addressed the crowd before John Edwards took the stage. 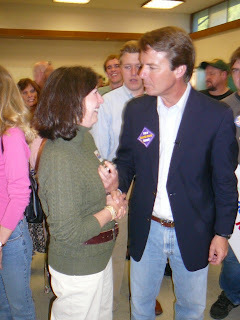 Edwards tackled Iraq, health care, education, immigration, and other important issues passionately and directly. The crowd joined in agreement numerous times in his desire for change by giving multiple standing ovations. 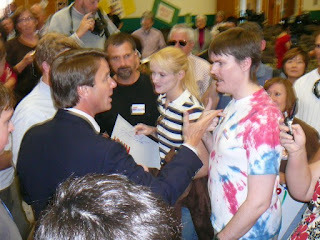 Edwards shook a countless number of hands, posed for photos and talked to many. Everyone from our group had the opportunity to meet him, get an autograph and take a photo if desired! Eventually, Edwards returned to a room at the side of the building and made a few phone calls. We helped with clean up and near completion of our tasks, when only a dozen or so volunteers remained, we were given a pleasant surprise – Edwards was still there! After wrapping up his last call, Edwards exited the room and thanked us. He posed for a few more pictures and signed a few more autographs in the smaller, more intimate setting. Shortly after, our carpool floated back in the direction of Sacramento on a natural high. We had reached Auburn before we realized we should probably eat our first meal of the day (it was now about 6 pm). I arrived home at about 8 pm. After hugging and kissing my wife and kids hello, I presented both my son and daughter with an Edwards rally sign, each one signed and personally inscribed to them by the next President of the United States! Our group will organize another carpool to Reno next month. I hope you can join us! 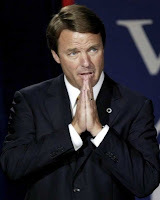 The recent news that SEIU's chapters in twelve states--representing more than a million workers--endorsed the candidacy of John Edwards is a loud wake-up call. The race for the Democratic nomination is still that: a real race. For my money, there is no other candidate who will work as hard as Edwards for the nation's low-income families, the working poor, struggling students and the 47 million Americans who desperately need health insurance. Organized labor sees him the same way, which is why he has garnered this seal of approval and the boots on the ground that it represents--even in the face of the Clinton juggernaut. They know that Edwards is the candidate who can actually win the general election, the one who is thinking about people like them. I first met Edwards at a gathering at the University of North Carolina's Center on Poverty, Work, and Opportunity. 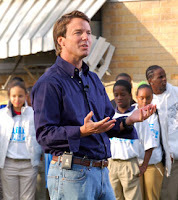 Hurricane Katrina had devastated the Gulf Coast only a few months before and exposed the "two Americas" of which Edwards had spoken throughout the 2004 campaign. He called the country's experts together--across party lines--to debate the causes, consequences and remedies for poverty in an era of unprecedented wage inequality. For two days we discussed what should be done to enhance the mobility of the working poor, how we should deal with the competition from low-wage countries like China and what the trends in out-of-wedlock births mean for single mothers below the poverty line. My conversations with Edwards persuaded me that he is the genuine article. Some doubt his commitment because they think a wealthy trial lawyer is not a credible force on behalf of the dispossessed. The next time Nation readers are tempted to think this way, I suggest they take a ride up to Hyde Park and check out the sprawling Hudson River mansion FDR called home. No greater contribution to the welfare of the indigent, the elderly, the unemployed and the sick has ever been made than that which Roosevelt enshrined in the New Deal. Notwithstanding the New Deal's flaws (and there were many), the social policy triumphs of the 1930s stand as an exemplar of what can be done when the will is there. If those victories could be catalyzed by one of the richest men ever to occupy the White House, then it can be done again by a self-made millionaire who earned his fortune attacking negligent corporations in the courtroom. But enough of the cheerleading based on background. What exactly does Edwards propose to do for the country's low- and moderate-income families? First, he tells us, we must raise the minimum wage to $9.50 an hour by 2012 and put legislation in place to ensure that it does not fall behind again. Second, he proposes the creation of public employment opportunities for those who cannot find jobs because they live in rural areas, blighted neighborhoods or communities without transportation. And while we're at it, how about focusing some attention on the regulatory structure that ensures we have safe food, clean water and working conditions that do not expose employees to hazardous chemicals? The protective legislation we rely on is all but devoid of enforcement capacity as a result of budgetary strip mining. Inspectors are disappearing, fines are not levied or enforced and families have to worry about whether the spinach on the table is safe to eat. Edwards is the only candidate who has emphasized the importance of targeting abusive industries that sacrifice worker safety and public health. Katherine Newman is the Director of The Princeton Institute for International and Religious Studies, and the Director of Princeton University's Doctoral Program in Social Policy.Â She is the author of No Shame in My Game: The Working Poor in the Inner City (1999), A Different Shade of Gray: Mid-Life and Beyond in the Inner City (2003) and Rampage: The Social Roots of School Shootings (2005), and the co-author of The Missing Class: Portraits of the Near Poor in America (2007, Beacon). Edwards Labels Clintons "Corporate Democrats"
DUBUQUE, Iowa, November 14, 2007 -- Former Sen. John Edwards today linked presidential rival Hillary Clinton and her husband, former President Bill Clinton, to a "crowd of corporate Democrats" who Edwards said have no more interest in changing Washington's culture than Republicans. Edwards criticized Hillary Clinton's acceptance of donations from special-interest lobbyists and pointedly reminded a regional conference of the United Auto Workers that it was a Democratic White House under Bill Clinton that failed to advance universal health care but delivered what he said were job-jeopardizing trade agreements. "That's what I mean when I say it's not going to change anything if we trade a crowd of corporate Democrats for corporate Republicans," Edwards said. Among Democratic rivals, Edwards has been the most direct critic of the Democratic senator from New York. But his rhetoric has taken on an even harsher tone as the time to Iowa's nation-leading presidential caucus on Jan. 3 draws nearer. In soliciting labor support by portraying himself as the candidate most attuned to union issues, the former North Carolina senator repeatedly cited Sen. Clinton's continued acceptance of campaign donations from federal lobbyists, which both he and Sen. Barack Obama of Illinois eschew. "The person who has raised the most money from Washington lobbyists, the presidential candidate, is not a Republican. It's a Democrat. The person who has raised the most money from the drug industry, from the health insurance industry is not a Republican. It's a Democrat. The person who has raised the most money—and this is most startling to me—from the defense industry is not a Republican. It's a Democrat," Edwards said. "The answer to every one of those questions is Sen. Clinton." Asked by reporters afterward if Clinton was a "corporate Democrat," Edwards said, "She is part of a system that includes a lot of corporate Democrats." Edwards also noted that in the early 1990s, when Hillary Clinton as first lady failed in trying to construct a universal health care plan, Democrats controlled the House and Senate as well as the White House. "We were in charge of every branch of government and those (special-interests) still killed universal health care," he said. "And we didn't get what we needed—universal health care. Man, we got something we didn't need. We got NAFTA. And NAFTA, just to remind you, did not pass and was not pushed by a Republican administration. NAFTA passed in a Democratic administration." Organized labor has been highly critical of the North American Free Trade Agreement pushed by President Clinton, and subsequent free-trade agreements, contending they have led to huge job losses in the country, particularly in the manufacturing sector. Hillary Clinton, who appeared earlier in the week before the UAW's Region 4 conference—which includes representatives from Iowa, Illinois, Wisconsin and Minnesota—told the group that the nation should take a "time out" from NAFTA to examine its negative effects on labor. Edwards also defended his call to act, as president, to take away federal health care from members of Congress until they approve a universal health care plan. Hillary Clinton and others have questioned Edwards' rhetoric by noting that the president does not have the power to take away federal health benefits. "The response of Sen. Clinton and members of Congress is to circle the wagons and focus on protecting their health care instead of what needs to be done for America," Edwards said. Edwards also touted his own universal health care plan, which mandates coverage. "Sen. Clinton's plan is similar to mine," he said. "Some would say she copied it. Understand, I didn't say that." On Saturday Democrats from the Central Valley gathered in Fresno for the first ever Central California Democratic Party Convention. It was a great event that you can read about at The Bayne of Blog. 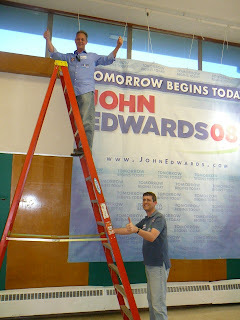 What I want to post here is these two pictures showing that the Edwards for President campaign is alive and well in the Central Valley. Gary Alford and Brenda Emerson are manning the table. Gary Alford and Brenda Emerson work the Edwards for President table at the convention. 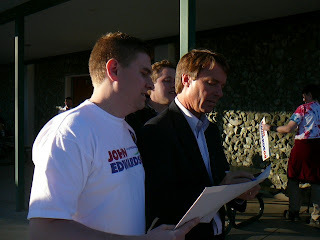 Gary Alford tells delegates why they should support John Edwards for President. 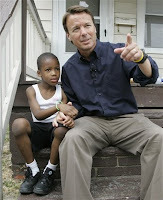 DES MOINES, IA -- Iowans for Sensible Priorities, a group seeking to redirect spending from the Pentagon to domestic needs, plans to endorse John Edwards Friday in Des Moines.The decision to endorse Edwards over Illinois Sen. Barack Obama came down to "courage versus caution," according to the group's executive director. "There's a rhetoric gap with Obama," executive director Peggy Huppert told ABC News. "He told me personally: 'Trust me. Ideologically, I'm with you.' But people have told him to be afraid of being pushed too far to the left. He doesn't bring up [cuts in Pentagon spending] on his own. He doesn't incorporate it into his speeches. He skirts around it. He talks around the edges. He never gets to the heart of it in strong, bold language." Edwards, by contrast, won over the group with his harder edge. He impressed the group on Oct. 26 when he demonstrated during an Iowa town-hall meeting that he would not back down in the face of Republican attacks. The day before, during an interview with a conservative talk-show host, Giuliani said that Democratic support for lower Pentagon spending showed a lack of concern for what Giuliani calls "the terrorists' war on us. ""Edwards gave an excellent answer," said Huppert. "He said we have to stop buying into their frame which equates spending money on the Pentagon with keeping us safe. He also said we can't have a Democratic candidate who cowers and runs away from this issue." "For whatever reason," she said, "John Edwards has decided he is going to take this on and he has staked out the position quite convincingly of being the un-Hillary." Although Clinton filled out the group's detailed policy questionnaire, she was not among the final two candidates under consideration for the endorsement. "She didn't answer any questions 'yes' or 'no,'" said Huppert. "She has a refusal to commit to anything." The Edwards endorsement is a blow to Bill Richardson. The New Mexico governor has gone further than Edwards in backing specific Pentagon cuts ($57.5 billion vs. $31 billion); he is alone among the major candidates in promising "no residual forces" in Iraq, and he wore the group's pin and touted its work during an AARP forum held in September. But in the end, Richardson, who lags in state polls, was snubbed because he is not viewed by the group as having a realistic chance of winning the Iowa caucuses. The overriding goal of Sensible Priorities, a group whose logo is a pie chart showing how Pentagon spending dwarfs domestic discretionary spending, is to redirect $60 billion in federal funds away from the Pentagon and toward education, health care, energy independence, job training and deficit reduction. Its endorsement was coveted by the Democratic presidential hopefuls, all of who filled out the group's questionnaire, because it has found 10,000 Iowans who have signed a nonbinding pledge to caucus on behalf of the candidate endorsed by the organization. "We're not going to change people's minds," said Huppert, referring to people who have decided to support someone other than Edwards since filling out a Sensible Priorities pledge card. "But we hope to shore up support for Edwards and to be a tipping point for people who are still undecided." The names given by 28 percent of the 10,000 "pledgers" are exact matches with Iowans who have participated in previous Democratic caucuses. Due to the organization's legal status, Sensible Priorities is not permitted to provide its list of pledgers to the Edwards campaign. But the group plans to communicate with its pledgers by phone and possibly by mail about the decision to endorse Edwards. The way Huppert sees it, both Edwards and Obama want to be "the un-Hillary," but they are approaching that task with radically different approaches: While Obama is promoting consensus and reconciliation, Edwards is selling confrontation and a day of reckoning. Asked if she is looking for a fight, Huppert shot back, "I think it's going to take a fight."